Manufactured by an Italian diamond tool company with 30 years of experience in the industry, these saw blades cut through granite with ease. They feature sandwich segments and sandwich silent core to cut fast and reduce noise level in the workshop. 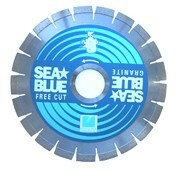 It is optimized to use with medium/low horse power saw.